By the Vomiting Varmints of Vogotth! From time to time we are called, as illustrators, to create a moving visual image for some generally unpleasant things. But I think this takes the cake, because not only is it visually arresting, but it's also a wonderful assault on our hearing as well. Jackson Guice manages to incorporate two great onomontoPOWias into the duel of the horking hounds of hell and they really help bring the entire spectacle to life. I like to imagine Mr. Guice at his drawing table, thinking through all the many questions these panels raise. What is the sound of a demon retching? Would it sound different coming from a different demon? Does a viscous stream of regurgitation make a noise when it impacts wetly? Why didn't I become a fireman like my mother wanted? Such are the conundrums that plague our souls as creative types, dear readers. Luckily they also pay the bills. 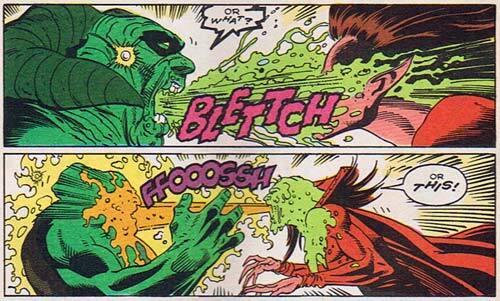 I just don't want to know what kind of real-world research Mr. Guice had to go through to determine that Mephisto's effluvium would sound like "FFOOOSSH" while Satannish's would be "BLETTCH" -- "Honey, pass me some more ipecac, I need the dog to throw up some more so I can compare it to the cat." 3 Responses to By the Vomiting Varmints of Vogotth! i am vomitus the oh god of hang overs feel my wrath! Wouldn’t it be the LETTERER who works up the sound fx? Or the WRITER who dictates what the sounds are to be. While Jackson “Butch” Guice can draw the hell out of stuff (no pun intended), I don’t think he had anything to do with this aside from portraying the vomitous battle itself.